I want to share with you that I too have begun a castle and am now 2-1/2 years into it. I am a past psychology professor for 20 years, then tall ship designer, builder, and sailor (Tallshipwindy.com), and now castle builder for my third career/retirement project. 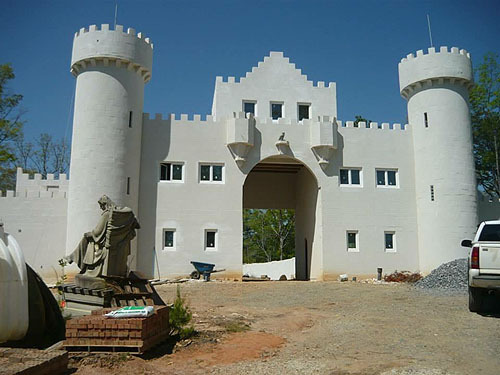 Our castle is named UHUBURG which translates from the German as Eagle Owl Castle, located near the Alpine Bavarian town of Helen, GA 30545 on 44 acres of forest and rhodeneron lower canope. It is a philosophical castle and citadel of epistemology (a grandiose ideal for sure). Essentially, it will house numerous gardens and inside perimeter wall mural that depicts the various ways man has historically tried to understand life from the Zoroastrian and Greeks to the religions of the world to present day science. Hopefully we will be able to open it to the public 3-4 days a week and earn enough to pay for the gardener and maintenance and taxes! It took a year to clear the land for parking, orchard, and building site, build a bridge across the 10' creek, build the 1600' road up the 200' mountain, and lay in the power, water, and septic tank systems. The last year and a half we have built the lower walls of the 2000 sq. ft. three story gatehouse (patterned after Neuschwanstein's gatehouse) and 1000' of the 1500' of perimeter wall that has two levels and is about 8' wide. With any luck in weather we hope to be finishing up the gate house and most of the wall this summer and begin the main house and great hall and 6 story tower late summer. Work is slow with only 5 workers and unable to work in cold weather but hopefully we can have a major construction completed in two more years before seriously developing the gardens. 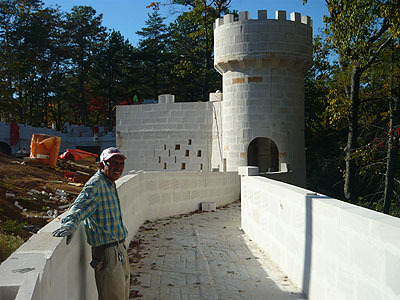 What is unusual about this castle is that we are building it out of Autoclaved Aerated Concrete block which is solid and has an R-11 plus mass effect insulation quality. It is also easy to cut and make turrets. We do not have a web site yet but will be working on it and let you know when we do. You can see more photos on my facebook page under my name. Last week we completed the first of 6 wall turrets, each 3 stories. It is the lowest one which begins down the hill and joins two walls of different elevations (8ft. difference). 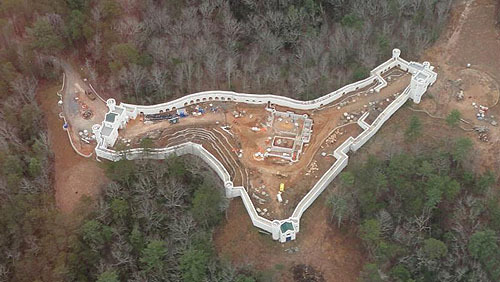 Another milestone was the completing of the upper level of the 1300 ft. perimeter wall. We only lack beginning the last and third gate house to complete the 2.5 acre courtyard. Attached is the first turret. I recently found that this castle has a facebook page - WOW. We have to use considerable amount of rebar with our light weight AAC blocks, but easier on the insulation for us. We have just begun the Great Hall and main house this year. I have attached an aerial shot taken from a friend's biplane on New Years Day. I am getting more anxious to get our Uhuburg done and have seen my way to hire one a few more helpers. So may be 2.5 to 3 years to go.